I was really nervous about this. I watched the first two episodes with both hope and trepidation. It’s been 20 years since we’ve seen a sitcom featuring an Asian American family on network television. I went in with low expectations. Any time you have a comedy based on ethnicity and cultural experiences you run the risk of creating caricatures rather than characters. You could end up alienating the group you’re trying to represent and/or being unrelatable to the mainstream. The good news is that Fresh Off The Boat, ABC’s newest sitcom based on Eddie Huang’s memoir of the same title, gets it right. Really, wonderfully right. What I found most enjoyable, and what I think will connect with audience members from any background, were the unexpectedly sweet and poignant moments. Most of us don’t know what it’s like to be a 2nd generation Taiwanese-American kid who just moved to a predominantly white community in Florida. But we do know what it’s like to feel Other. We know the desperate desire to belong. Certainly, as a mother, I know the terror of meeting a new flock of moms. As young Eddie (played by the talented Hudson Yang) would say, we’re all just trying to get a nut. You know? The music. It made me want to go dig out some mix CDs, because dammmmn. And that moment in the car when Ace Of Base is playing and Eddie has his earphones on to drown them out while the rest of the family happily sings? The car radio struggle was real, man. I’ve lived that. Can we talk about Constance Wu? She’s a superstar. Her performance as Jessica is brilliant. I die. “Do you think I like pretending that Samantha isn’t carrying a baggie of dog poops in her hand? No! I don’t like this! We all see the poops there! It’s rolling around.” Indeed, Jessica. Who among us hasn’t had to turn a blind eye to a metaphorical poop in an attempt to fit in? 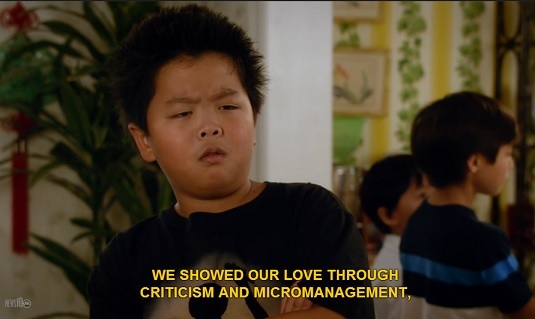 A lot of Fresh Off The Boat is about assimilation and fitting in, and it’s perfectly illustrated when, after being teased at school, Eddie begs his parents to let him have “white people lunch.” They don’t get why he wouldn’t rather have his mother’s delicious cooking but they do see that he is having a hard time. When Jessica takes Eddie to buy Lunchables, it’s such a great example of the confusing, complex struggle of a mom trying to help her kid to survive in a world she doesn’t totally understand. I want Fresh Off The Boat to succeed, not because it’s a change from the typical American family sitcom, but because in all the important ways, it is a typical American family sitcom. The characters look different and they talk funny and they eat food you might not have heard of, but you relate to them because we’re not all that different, really. The Huang family wants the same thing a lot of families want: success, security, love, acceptance. And they remind us of these universal truths: growing up is hard and families are weird. I would have liked to see more of the cafeteria scene between the African American kid (who seems to be the only one in the school) who tells Eddie “You’re at the bottom now!” That was piercing on a lot of levels. 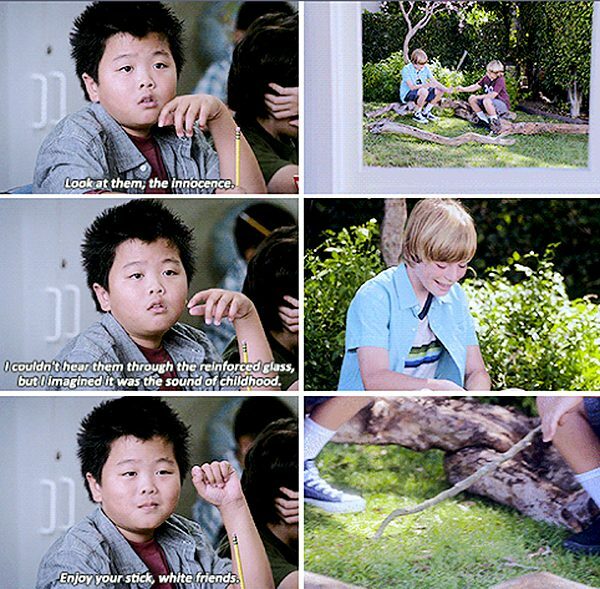 I wish we’d actually seen what happened after he called Eddie a chink. I know, I know. It’s a half hour show. And the scene in the principal’s office was great. So, okay, I guess I don’t really have any complaints. Note: This morning I read this piece on SFweekly.com by Katy St. Clair. And my head almost exploded because the original title was “Fresh Off The Boat Makes It Seem Like Asians Are Actually American.” It’s since been changed and a reference to Confucius (are you KIDDING ME?) was removed. I was going to write a long, ranty-pants response, but I’ve decided it’s not worth it to respond to a reviewer who can’t be bothered to name a single actor on the show, who seems to be unaware that the show is based on an actual memoir, who compares it to Good Times because that seems to be the most immediate connection she can make even though the only similarity is that both are shows about non-white families, and who ends her piece with this bit of condescension: “I celebrate the idea that an American group is finally having its day in the digital, but unfortunately, as with real life, they will need to do even better than their competition in order to gain acceptance. And that, gentle reader, is just the way it is.” I do hope she gives it another chance, though. Because she is exactly the kind of person I hope will be changed by this funny, touching, American comedy.